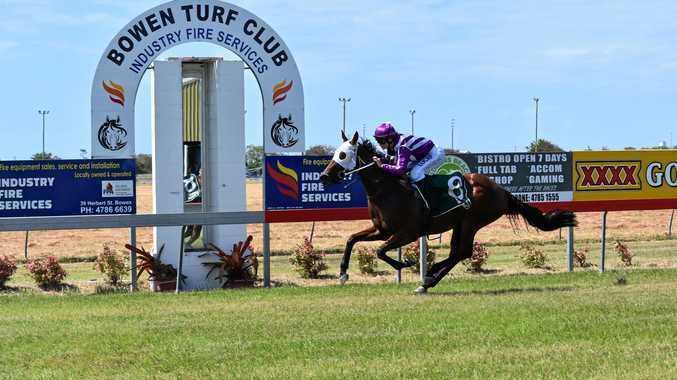 WHITSUNDAYS regional editor Gregor Mactaggart has again pulled out the crystal ball in a bid to find the punters a winner at Bowen on Friday. The strong seven-race program is the third TAB meeting in the month of March and showcased nationally through Sky Racing. The first race is at 1.34pm and the last at 5.20pm. The track was rated a Good 4 on Thursday night. The scratching of Oriental Girl appears to have really opened up the race for Bettahoney. Got the job done as the even-money favourite this track and trip last Friday. Not sure if I want to take $1.65 about her. On exposed form, the danger has to be Craiglea Altona. Looked a horse of promise when winning at Rockhampton over 1050m two back, but the last-start flop leaves questions. If Les Tilley can get control, might be difficult to overhaul late. Debutant Golden Treasure does come from astute CQ stable and wouldn't discount sharp improvement on her exposed trial appearance. SUGGESTED BET: EXACTA: Craiglea Altona to beat Bettahoney/Golden Treasure. FIRST 4: Craiglea Altona/Bettahoney-Golden Treasure/Bettahoney-Golden Treasure/Craiglea Grace. Tricky race to assess. After much deliberation came back to Loveisallyouneed. Was $10 into $5 ahead of good second at Cairns over 950m last time in first run as a three-year-old. Drawn well, should get a good run. Liked the run of Jack Reacher at $21 here last Friday and don't think the 1200m-1000m is that big of a negative. Again from an inside gate, could sit just off the speed and pounce late. Lanzoffany led and tired late in 1280m assignment here on March 2. Was keen on it that day and will butter up again each-way, although there is a risk he could be deep from the gate. Muzanboal Rouge ran second in the same race and deserves strong consideration. Exceeding Assassin tied to the favourite from the form race and SP profile. Getoutofmyneigh has his hoof on the till. Been minor placed his past four starts taking in Mackay and Cairns. Gets another chance to break the duck and was priced $4.20 on Thursday night. Going In Style went awful in first NQ start here on March 2, but boasts good Riverina form over further trips and sharp improvement wouldn't surprise. Candy Girl racing well and stable has struck some form. This looms as a tricky gate for her to overcome. Written Image another racing well, placed both runs here and on previous runs 1280m shouldn't be an issue. Dubai Me Saga not the worst $71 chance I've seen. SUGGESTED BET: Getoutofmyneigh (WIN), Written Image (EACH-WAY). BOX TRIFECTA: Getoutofmyneigh, Going In Style, Candy Girl, Written Image, Dubai Me Saga. He's in the veteran class these days, but Thurston is a smart horse on his day. Performs well fresh and I can see him getting a soft run in transit on the speed, ideal for a race of this calibre. Especially at $7.50. Crimson Halo good at Cairns and stiff not to get the cash that day. Is 950m-1280m second-up, but certainly a capable customer. Uthred brings strong CQ form to the table and has former NT jockey Richie Oakford in the saddle. Don't Cheat Charlie is an include for the quaddie, along with the dependable Strong Will. SUGGESTED BET: Thurston (EACH-WAY), Don't Cheat Charlie (EACH-WAY). Cosmological is low-flying and was truckloaded ahead of his win here last Friday. Back from 1200m-1000m and up in class, so this harder. Saying that, won four of six this preparation. Think the $1.75 is a bit skinny here, but happy to back him at evens or better. Le Chiffre has put two good runs together at Mackay after getting beat 60.7 lengths (no misprint) at the start of February. Looms as the obvious danger. Shrouded's form looks good next to Le Chiffre and she's $7.50. Lokum won the Bowen Cup last preparation. Is clearly better over further, but cheeky run fresh wouldn't surprise. Deep, deep race. After much deliberation reckon I found a good each-way bet in Kap It Off. Was priced at $19 on Thursday night. Doesn't win out of turn, but drops back in class from first-up appearance, drawn well, should sit handy and solid second-up starts (although without a win). Happy to find out if I'm right at that price. Mr Sonador resumes and won fresh last preparation in maiden company. Diamond Country excellent maiden winner last week and steps up in grade, but is a horse of good promise. Cornish Tales probable improver. Lady Mirabella has campaigned in tougher races. Anne Catherine a four-time winner and Naughty Corner might live up to his name if you leave him out of the quaddie. SUGGESTED BET: Kap It Off (EACH-WAY), Mr Sonador (EACH-WAY). Gone with the toppie Arno Bay in the last. Been a fan of this horse for a long time and looks well-placed in this company. Strong second-up form piques the interest and will be motoring home late. Carlino's Way has not turned in a poor run this preparation and the form through Kirabo and Our Boy Pendles reads well for a Benchmark 60 Handicap. Reactant was an eye-catcher behind the promising Emberspeed. Stays at the same trip and could well be closer in the run from low draw. Little Hunter always has plenty of fans and is short in the market again despite last start flop at Rockhampton. SUGGESTED BET: Arno Bay (WIN), Reactant (EACH-WAY). COST: $28 for 10 per cent.